The Fresh Music Page: 11 Year Old Singer/Organist Jeremiah Jackson OMG This Kid Has A Future! 11 Year Old Singer/Organist Jeremiah Jackson OMG This Kid Has A Future! Anyone that knows me can tell you: I can't stand kids singing. Of course you have Stevie Wonder and Michael Jackson who were both extremely talented children but that's just rare. Children performers are just annoying to me. There is an exception to the rule. I love Children in the church. I can listen all day to children praising God through song. It brings me great pleasure to introduce you to Jeremiah Jackson singing "Be Blessed". 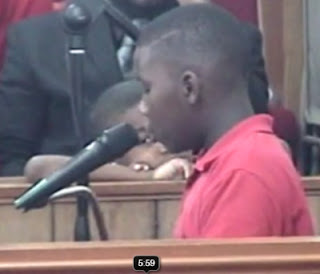 This young man is only 11 years old, plays the organ, sings and testifies too! I believe this young man has a great future. His parents also deserve a big pat on the back. I hope he stays in the church.